It’s a chilly winter’s morning, and as I make my way up the children’s slide in a park next to the airport, I can feel the ice-cold railing sticking to my hands. What am I doing in a kiddies’ playground in sub-zero temperatures at dawn, when normal people are at home having breakfast? Simple, really: I heard that an Antonov AN124 was landing at OR Tambo International Airport. Knowing how rarely I see a plane like this land here, I got out of bed at 4.30 am to catch a glimpse of the big beauty. 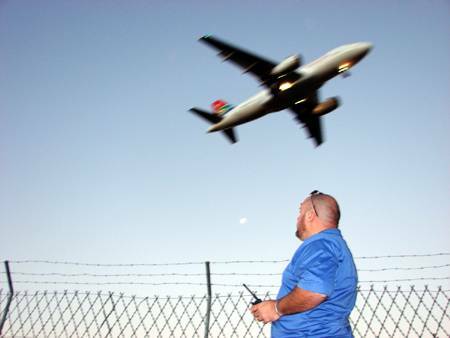 I started planespotting when I was about five years old, at Ysterplaat air force base in Cape Town. I used to visit my uncle, who was in the air force, and would go to the end of the runway with my cousin to watch military aircraft take off and land all day long. My favourite plane was the big old Shackleton… it was so huge and so graceful. Our house was located along the flight-path of commercial aircraft, so while other kids were riding bikes and playing pinball, I would settle on the lawn with a blanket and a cooldrink and try to make out what kind of aircraft were flying overhead, using my dad’s binoculars. In 2003, after a long hiatus, I started going to the end of the runways at OR Tambo (then Johannesburg International) with my 6-year-old daughter, who loved watching the big Boeings and Airbuses. The bug bit me again and I used every spare minute over weekends and in the early evening to spot and note. I bought an air band-frequency scanner to pick up the call-signs, which helped me to work out which planes were landing, and where. This little workhorse has served me well for more than four years. I spot most of my time around OR Tambo and occasionally take a drive to Rand Airport to watch smaller aircraft and helicopters take off and land. My hobby has taken me to Durban, Cape Town and a host of smaller airports and airstrips in places like Springs, Brakpan, Kittyhawk, Bapsfontein, Pilanesberg, Petit and Lanseria. I started taking photos of aircraft in 2004, using a cheap digital camera, and upgraded the following year. By the end of 2005 I was taking very good photos – so good that I decided to print them and show my family and friends. In 2006, I entered a magazine competition and won 1st prize, following up last year by taking the first three places. At this point I decided to set up a Web site (www.planespotter.co.za) ,dedicated to the men and women who make our lives a lot easier (the pilots and crew) and to those who simply love flying or building aircraft. If this sounds like your kind of thing. My advice is to join the EAA (Experimental Aircraft Association). You get to know the guys who put their life and soul into aviation; most of the members are pilots and small-aircraft owners. Highlights? One was the arrival of the giant Airbus A380. It was an awesome experience, and one I won’t easily forget. Another was my first sight of ZS-SPC, a Boeing 747-SP that landed at Rand Airport: it was destined for retirement in the SAA Museum. It was incredible to see a 747 land on a runway that was designed for small aircraft. The pilot actually carried out two low-level missed approaches – and that made my day! For obvious reasons, security concerns can sometimes cause problems for planespotters. The police sometimes want to know why we are taking photos of commercial aircraft, but we generally manage to convince them that it’s our hobby, and they usually leave us alone for a while. Insider tips? Well, in a small Johannesburg suburb called Impala Park, there’s a children’s playground equipped with swings and a slide. The latter is a favourite gathering spot for planespotters, and on certain days you might see seven or eight grown men holding on grimly as they try to catch a glimpse of a big aircraft as it lands.